Jean Darby was named Outstanding Citizen of the Year, and Winzeler Stamping was recognized with the Outstanding Business Award at the Montpelier Area Chamber of Commerce Annual State of the Chamber Banquet, held in the atrium of the Quality Inns and Suites on the evening of February 28. Members and guests were entertained by the Montpelier High School Jazz Band while they dined on a buffet catered by JJ Winns Restaurant. Prior to the commencement of the business portion of the event, the audience was again entertained by a selection of musical numbers presented by the Montpelier High School vocal ensemble, Locomotion. “I was trying to think of how I wanted to approach speaking to you tonight. I’m not necessarily a business owner; I’m the consumer. I’m the citizen. But I’m also a leader of an agency which serves you. And in the end, I kind of chose to make this a sort of a half time locker room speech. I hope I don’t bore you and I hope I don’t take a lot of your time. But what I do hope is maybe you can be inspired by the end. I’ve spent almost a quarter of a century being a public servant. In that time, I’ve worked in a large urban area for government, a very small government entity, a multi-jurisdictional government entity, finally coming to rest here in Montpelier in 1999. You know Montpelier…it kind of embodies everything that I remember growing up. I grew up on a farm. I’m a farm boy, but I grew up outside of the lake community, so I got to see a little bit of what was going on with that type of activity. But Montpelier kind of embodies everything that I remember that I cherished growing up. Kind of that community, family spirit-type of community, and I really enjoy it here. Something that you probably don’t know about me is I’m a lover of history. I don’t believe that we can be successful in the future if we don’t honor and remember our past. I think back to those early times when Montpelier was first being built. I smile because I like to think of the people of yesteryear took the time and the dedication, and used innovation to make Montpelier happen. Remember a few years back; we had our Main Street redone…resurfaced. A lot of you probably remember that. I know you were happy with the construction process. I made sure to go out to that street, and I grabbed a brick. How many of you grabbed a break out of that street? I did. I was holding the brick, and I drifted off thinking about past times of Montpelier. Imagine all those hard working individuals back in…let’s see, what was it? 1874 when we were incorporated? Is that right? Somebody correct me if I’m wrong. 1845? Okay, see, that’s even longer than I. But I remember very good, my history is not so good. I just remember standing there holding that brick. And for a moment, I wanted to kind of capture when somebody was riding a horse down that street, or when they had their buckboard and they were going to get something, or they had their Model T and they were driving down the street. They were forging a new place to live for your families, our families and the community. I drifted off thinking about the old police officers back in the day who walked the beat, swinging the club around, maybe getting into a few foot chases, driving their old Chevys down the road responding to calls. Those windup sirens, wind down sirens. You remember all that? I kind of got overwhelmed by the thought of all, those innovators who built this town, the commercial business district and beyond. It’s amazing isn’t it? It’s amazing to think somebody took the time to do that for us today. But I recognize that I don’t live back in that time. We live in a different time today. I think that the Montpelier I live in is a much greater community than it was back when it was founded. This is without a doubt one of the most gracious communities I’ve ever been around, and I’ve been around a few. It’s filled with talent. I look at the businesses that have withstood time like Winzeler Stamping. 100 years…congratulations! And then I look at new businesses that have come in…some unique businesses like Cookies on Demand who are making something that we’ve never had around here before, and they’re doing something good for our community. so thank you. It’s not just businesses, its people. This is a great community of great people. I’ve watched this community pour out their hearts to a family who lost their home to a fire. When we asked for funds for a canine, you all showed up and you gave us funds for a canine. Just this last year you stepped up. We had a ‘No Shave Montpelier’ event where we raised funds to help pay off negative school lunch accounts. That was tremendous. In 30 days, you all raised $5,000, for that. Just as a side note, not that I want to pick on them, you’ve heard of this community called Fort Wayne? Yeah? They’ve got a department of 1,000 officers. They raised $2,600 in a month. That’s what you all do. You raised $5,000; you doubled a place like a Fort Wayne. That’s the gracious giving talent that we have in our community. I see our school striving to get better. That can’t be more evident if you look at the facility, the infrastructure. I look at our town. Yeah, you know people can say a lot of different things, but I’m a believer. I’m a believer in Montpelier. I know what this community has to offer. I see your desires to bring us into the future, while maintaining that historical flair. We have seen improvements in our parks, which by the way I think is the best park system ever. I think that goes right down to our village and Sandy Damschroder and Dan Brown, and I think that they should be recognized for that because they do a tremendous job. With a little determination and some patience, we might see a trail that connects the Wabash Cannonball Trail in the future. We don’t know, but we’ve got to believe that it can happen for us. We’ve seen improvement in our utility infrastructure, reaching out for grants and capitalizing on the remarkable talent and minds of the people within this community. I don’t think anybody should be any more proud of the community than what we should be of ours. Speaking of our agency – the Police Department – we work hard all the time to take people who are causing problems off the street. We also understand budgets; we reach out for grants. And again, we also capitalize on the remarkable talent and minds of the people within the community. Our agency works hard all the time. We partner with other groups, local church groups, the Health Department to better impact people for the long term, and the last few years we’ve done more to add resources to our capabilities so we can help fight crime. We added the canine, which has been very successful. We’ve had some very good success with that dog, and we thank you very much for you stepping up and giving us that tool. This year, we added a School Resource Officer to help continue to build a bridge of communication, not with just the school, but with the kids and the parents. It’s not just about security; it’s about building a bridge. We added an alert team several years ago, so when we handle high-risk situations we have better trained officers doing those things, so there’s less likelihood of somebody getting hurt…and that’s both us and the public. I want you to know that MPD is also sort of commerce-minded. We understand that by making our community safer, it makes it more appealing to those who want to build and do business here. And that’s part of our goal, too. Montpelier should feel proud of what we’ve done, and where we’re going. I don’t just mean the Police Department, I mean the community itself. It is such a great sense of pride that I believe you haven’t seen anything yet, but it cannot be done by one. It must be done by all those talented people who sit in this audience, who even sit at home tonight or maybe off at college. We need to tap into that talent that is out there and do things to make our children want to stay here, raise a family, build on a business or help build a business. Tonight I’m going to throw a little challenge out to our business leaders. We all want a better community, right? We all want a thriving community. We all want to see Montpelier grow. I challenge you to take advantage of the Wednesday night events, the Business After Hours, to network and collaborate. Learn about each other, and how we can help each other. I challenge you to be an active participant, and seeing our commerce grow. I was talking as I often do with people. I don’t remember who it was I was talking to, I apologize, but we were talking about the different things that are going on here. I challenge you to reach out to the school and tell the school, ‘Hey, these are the skills that we’re lacking from our workforce. How can you help us, and how can we help you?’ I challenge you to help the Planning and Zoning Commission in their endeavors, guiding zoning laws and helping approve projects that will hopefully make a positive impact on our community. I encourage you to reach out, not just to Montpelier, but beyond Montpelier. Try and secure commercial businesses and industry into our town. Look what we in Montpelier have to offer. There’s property. There’s roadways. There’s great infrastructure. We have innovation for unique businesses, and we have determination, and sustainment, and businesses that have been here for a century. That beams pride in Montpelier; that means pride. To steal something from national politics, I’m not looking to make Montpelier ‘great again.’ I love Montpelier; I think we ARE great. I’m looking for us, not only as individuals but as a community, to make Montpelier better tomorrow than it is today. I love our history, but I’m counting on our future, and so are my children and your children. We’ve seen significant improvements, yet we are left a canvas yet to be fully painted. You all have a brush in your hands. It will take courage, perseverance, and an unrivaled will. It is a competitive market out there, and I don’t know if you realize this, we’re kind of tucked in the very corner of the state. Chief McGee then called Barbara Watson of the Montpelier Area Foundation to the podium, along with Montpelier Area Chamber of Commerce Executive Director Susan Gearhart. Finally, Chief McGee called forward a distinguished guest to the podium, Ohio Fifth District Congressional Representative Bob Latta. Chief McGee turned the podium over to Ms. Watson, who introduced presented the 2019 Outstanding Citizen Award featured by the Montpelier Area Foundation to Marilyn Jean Darby. “I need to give you her history,” Ms. Watson began. “She was born in 1942, a graduate of Edgerton High School in 1960…don’t do the math. She married Eugene Darby from Montpelier in 1962. They have three children in the states of Ohio, Idaho and Washington State. She has eight grandchildren and one great-grandchild. In December of 1963, she started employment with what is now the law firm of Bish, Butler and Thompson in Bryan, and in 2015 celebrated 50 years of employment with them. 50 years…and she still works three days a week. She’s a member of the First Presbyterian Church in Montpelier, and has been the church treasurer since 1992, a member of the Williams County Fair Foundation since 1978, and organized food services for them until 2014. That sounds so simple, but Jeannie did so much more. She ordered the food and picked it up, sometimes picked the menus, organized the worker schedules and even spent time at the stove, and probably the sink too. She was the Treasurer of the Fair Foundation from 2010 to 2015, and was elected again in 2019…and I’m not done. I’m just taking a breath. She’s on the Montpelier United Church Women Luncheon Committee in the 80s and 90s, which served up to 400 women and raised funds for local charities. She’s a current member of the Williams County Historical Society, and Power in the Purse. She’s a former member of the Athena Study Club, and the Montpelier Civic League. She is a member of the Williams County 4-H Endowment Committee since 2015, and currently serves as the Acting Secretary. She is a member of the See and Do Club Board of Directors since 2017, and is the current Secretary. Are you keeping track? Are you are you writing down all this? She is a member of the Montpelier Trackside Model Railroad Club, and organized their Cabooster Club which provides the club’s financial support. “I’ve got to get my breath,” Ms. Darby said upon arriving at the podium. “I want to thank you very much for this honor… totally unexpected. I am honored and humbled that my name even came up. I believe in doing things for others, but I usually prefer working behind the scenes. I’m usually back there in the kitchen, and I am certainly not comfortable up here in front of all you all. God has been good to me. I have a wonderful family that supports me in all that I do, although I have heard those words, ‘You’re never home,’ a few times. Chief McGee then invited Congressman Latta to read a proclamation. Chief McGee returned to the podium to announce that the Montpelier Chamber of Commerce 2019 Outstanding Business of the Year was none other than the century-old Winzeler Stamping. Mr. Mike Winzeler came forward to accept the award from Ms. Gearhart, and to address the audience on a note of foresight from the company history. Mr. Winzeler said, “I’d just like to share a passage that my dad wrote back in the Leader Enterprise for our 50th anniversary, 1969, when he was talking about the future of Winzeler. And so I’ll just share a little bit of what he wrote, so bear with me. ‘I think our future growth will be steady, not spectacular. Diverse and interesting. Not necessarily more of the same, widely spread, not dependent, and highly spiced with ideas both good and bad, with the frustrations and satisfactions that accompany such an enterprise. Finally, what kind of company will it be in an age of conglomeration, where family businesses have been swallowed by bigger family businesses and then those by public corporations? Will Winzeler’s Company succumb to that? Will the problems of expansion, capital, estate taxes, family disinterest or conflict, or shortage of sufficient management in the family that overcome so many family companies consume this one? Changing times and circumstances will really determine the outcome. But if the attitudes of past give us any clues, it would be hard to imagine this family not managing our own company. If we tackle another 50 years (which we have), we might characterize it this way. A number of companies, always considered small businesses, scattered around the country or even the world in some unlikely places, somewhat autonomous operations, well managed, eventually with the owner’s attention, varying from seeming non-involvement to frustrating attention to detail, but always with the ultimate responsibility for success. Companies continue to grow steadily, sometimes shifting products and directions, paying good wages, fringe benefits, and employing good people, attempting to be fair and more and often more than fair, respecting company loyalty and worrying about its opposite. Running a clean shop and giving the customer a little more than he’s entitled to. Success might be defined as ‘All bills paid every Friday’, so we won’t say the future looks bright or the future looks bad, or even sales will be up 12 percent or earnings 15 percent. We don’t promise to sell over 7 million stampings next year. We will say though, that the past 50 years have been pretty good when you really add it all up. So maybe the next 50 will be too (and they have). We plan to take them one day at a time because that’s the way they went by, and that’s the way they’re coming at us. And that’s the way we want to live, because they won’t come by again. 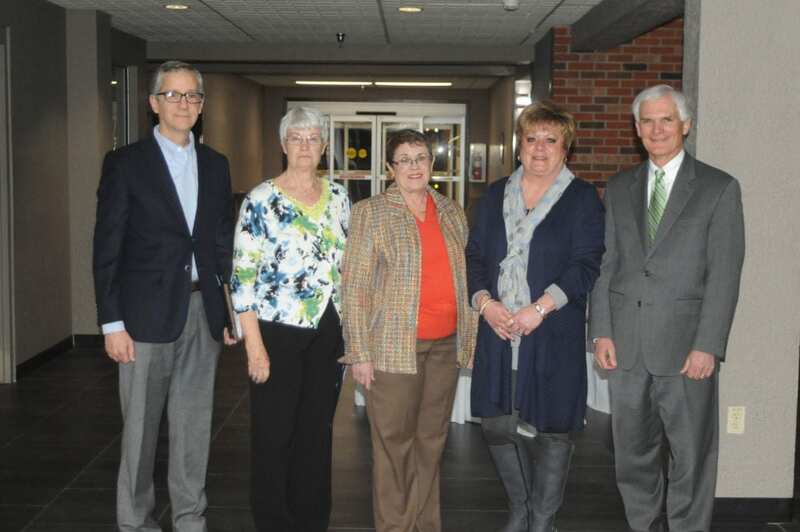 Be the first to comment on "Jean Darby & Winzeler Stamping Recognized At 2019 Montpelier Chamber Banquet"